Team GreatBay_China 2018 characterized J23119, Part:BBa_J23105, and Part:BBa_J23101 by assembling them with Part:BBa_B0034 and a sfGFPPart:BBa_I746916 on three vectors: pUC20 (copy number about 500/cell), pR6K (copy number about 15/cell), pSC101 (copy number about 2/cell). Then we measured the fluorescence by Flow Cytometry as a reference for the TALE stabilized promoter library. We participated in the InterLab Study and came to know this part as a strong promotor in comparison with J23106 and J23117. It inspired us to use this promotor also for the characterization of our mNeonGreen part []. This promoter shows activity repression as a function of AHL in presence of LuxR [ADD REFERENCE LINK]. Results are shown below for a set of widely used promoters tested in the same conditions (TOP10, M9 medium supplemented with casamino acids and glycerol, assayed in a microplate reader). Promoters drive the BBa_I13507 RFP expression device. The TACTAGTG scar is present between promoter and RBS, except for PLlacO1 (BBa_R0011), PlacIQ (BBa_I14032) and PR (BBa_R0051) where the scar is TACTAGAG. RFP was measured and used to compute Scell (arbitrary units) or RPU values. Promoters were assembled in pSB4C5 and were co-transformed with BBa_S03119 in pSB3K3 in TOP10. Blue bars represent the activity when no AHL was added to the medium, while green bars represent the repressed activity (AHL 20 µM was added to the medium). Only BBa_J23101, BBa_J23102 and BBa_J23104 showed repression and, for them, percent repression is reported. Kosuri et al., Composability of regulatory sequences controlling transcription and translation in Escherichia coli, Proc Natl Acad Sci U S A. 2013 Aug 20;110(34):14024-9. doi: 10.1073/pnas.1301301110. Epub 2013 Aug 7. This Anderson promoter was evaluated without fused RFP with the lux operon as a reporter in B. subtilis. See the new BioBrick BBa_K823005 without RFP and have a look at the Data from the evaluation in B. subtilis. These three promoters are from the Anderson Promoter Collection, which is a library of constitutive sigma70 bacterial promoters. The strength of each promoter of the library has already been estimated in saturation growth phase cultures in LB, but here we provide the characterization of BBa_J23100 and BBa_J23118 in standard units (RPUs) in LB medium, in order to add experience and data for these BioBricks. BBa_J23101 is the reference standard promoter, so it has RPU=1 for definition. The data shown below are referred to BBa_K173000, BBa_K173001 and BBa_K173002 that are the measurement parts of BBa_J23100, BBa_J23101 and BBa_J23118 respectively. 8 ul of long term storage glycerol stock were inoculated in 5 ml of LB + suitable antibiotic in a 15 ml falcon tube and incubated at 37°C, 220 rpm for about 16 hours. The grown cultures were then diluted 1:100 in 5 ml of LB or M9 supplemented medium and incubated in the same conditions as before for about 4 hours. These new cultures were diluted to an O.D.600 of 0.02 (measured with a TECAN F200 microplate reader on a 200 ul of volume per well; it is not comparable with the 1 cm pathlength cuvette) in a sufficient amount of medium to fill all the desired microplate wells. These new dilutions were aliquoted in a flat-bottom 96-well microplate, avoiding to perform dynamic experiments in the microplate frame (see Frame effect section for details). All the wells were filled with a 200 ul volume. If required, 2 ul of inducer were added to each single well. 15 seconds of linear shaking (3mm amplitude) followed by 10 seconds of waiting before the measurements in order to make a homogeneous culture. Variable experiment duration time (from 3 to 24 hours). All our growth curves have been obtained subtracting for each time sample the broth O.D.600 measurement from that of the culture; broth was considered in the same conditions of the culture (e.g. induced with the same inducer concentration). The natural logarithm of the growth curves (processed according to the above section) was computed and the linear phase (corresponding to the bacterial exponential growth phase) was isolated by visual inspection. Then the linear regression was performed in order to estimate the slope of the line m. Finally the doubling time was estimated as d=ln(2)/m [minutes]. In the case of multiple growth curves for a strain, the mean value of the processed curves was computed for each time sample before applying the above described procedure. The RPUs are standard units proposed by Kelly J. et al., 2008, in which the transcriptional strength of a promoter can be measured using a reference standard, just like the ground in electric circuits. ABS is the blanked absorbance (O.D.600) of the culture, computed as described in "Growth curves" section. it uses a reference standard and so measurements can be compared between different laboratories. strain, plasmid copy number, antibiotic, growth medium, growth conditions, protein generator assembled downstream of the promoter must be the same in the promoter of interest and in J23101 reference standard. steady state must be valid, so (dF/dt)/ABS (proportional to the GFP synthesis rate per cell) must be constant. Plot (1) contains growth curves of the cultures, after blank value has been removed. Every curve is calculated averaging on three replicates of the same culture and subtracting the blank for each time sample. Blank is calculated averaging the replicates of blank wells. Plot (2) shows the logarithm of absorbance in exponential phase of bacterial growth, determined by a visual inspection of log-plots. These values are used to evaluate doubling time and R.P.U.. Plot (3) contains (dGFP/dt)/O.D., the value named S_cell in Kelly J. et al., 2008 procedure for RPU evaluation. In these plots are reported black veritcal lines that define the range of values used to evaluate RPU. It is important to underline, as explained in next paragraph, that RPU are calculated on cultures at the same O.D. level, not at the same time. The second graphic shows S_cell VS O.D.. This plot allows the conparison of S_cell values between different cultures, that are supposed to reach the same level of growth not at the same time, but at the same O.D. value. The third graphic shows the induction curve. The RPU value is calculated on S_cell values corresponding to O.D. values in exponential phase (typically, from 0.05 to 0.16). The curve is obtained averaging in time S_cell values corresponding to exponential phase. Error bars rapresent the minimum and maximum value of R.P.U. belonging to the range of O.D. in exponential phase. Antibiotics were: Ampicillin (Amp) 100 ug/ml. All of them were stored at -20°C in 1000x stocks. Amp was dissolved in water. LB medium was prepare with: 1% NaCl, 1% bactotryptone, 0.5% yeast extract. The medium was not buffered with NaOH. We used a number of the constitutive promoter family members for testing our biobricks. The constitutive promoters show the expected level of fluorescence when transformed into E. coli TOP10 cells. Placing parts behind the promoters turned out to be relatively straight forward. We used this part in combination with several biobricks for building our constructs e.g. BBa_I750016 was placed behind the promoters. The BBa_J23100, BBa_J23101, BBa_J23105, BBa_J23106, BBa_J23110, BBa_J23114, BBa_J23116, BBa_J23118 were charcterized in LB and M9 supplemented with glycerol (0.4%) growth media in high copy and low copy vectors in E. coli TOP10 (BBa_V1009). RPU and doubling time were characterized for all of them, according to the protocols reported below. In order to build low copy plasmid measurement systems, the EcoRI-PstI fragment (J231xx-RFP) of each BBa_J61002-BBa_J231xx was assembled into pSB4C5 vector. This fragment contains the constitutive promoter of interest upstream a RBS-RFP-TT expression system. Figure 7 - R.P.U. of the studied promoters from Anderson promoters' collection, M9 medium and low copy plasmid (pSB4C5). These plasmids were constructed by assembling the EcoRI-PstI fragment of BBa_J61002-BBa_J231xx in pSB4C5 vector, in order to transfer the promoter and the RBS-RFP-TT expression construct from BBa_J61002 to pSB4C5. 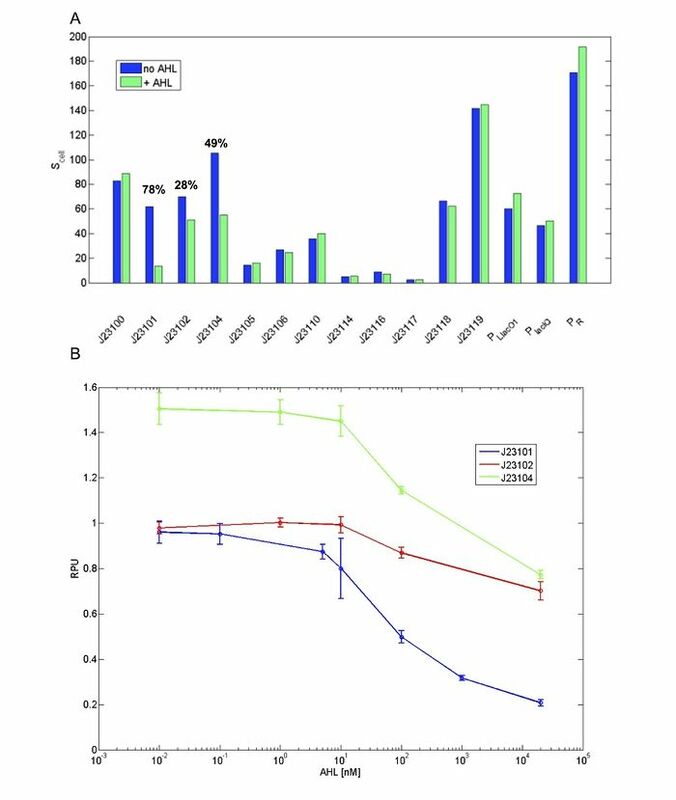 It was not possible to evaluate promoters activities in low copy number plasmids in LB because the RFP activity was too weak and not distinguishable from the background. Discussion: we observed that the ranking previously documented in the Registry is not valid in all the tested conditions, even if a general agreement can be observed. As an example, BBa_J23110 in high copy plasmid is stronger than BBa_J23118, in contrast with the ranking reported in the Registry. Promoter strenghts in MG1566 and DH5alpha, relative to J23101. A promoter test was carried out to put synthetic and natural promoters on the same scale. Every promoter was assembled before B0032-SYFP2 (BBa_K864101) in the backbone BBa_K592200 (very similar to the pSB3x5 backbones). The test was performed in E coli expression strain MG1655 and cloning strain DH5alpha, by flow cytometry fluorescence measurements of single cells. Triplicates of each strain and promoter were inoculated in 2 mL LB media with spectinomycin (50 µg/mL) and grown overnight shaking at 37° C. Samples were equilibrated in PBS solution at 1:160 dilution for one hour, and then measured by a BD Biosciences FACSaria III. 10^5 cells of each sample were individually measured and averaged, with dead and other non-flourescent cells excluded. Promoter strength is noted as fractions of the reference promoter's, J23101, strength in corresponding strain. 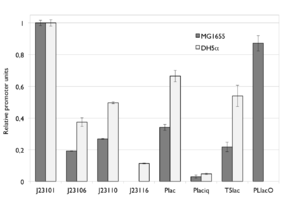 The variance in expression between MG1655 and DH5α may depend on the reference J23101. The maximum protein expression may be lower in DH5α, due to its lower fitness resulting in lower expression of SYFP2 in the J23101 construct. 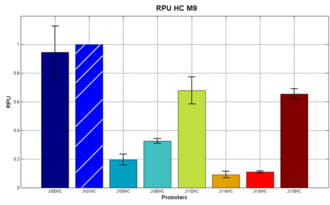 Alternatively, the clone with J23101 in DH5α may have been weaker than average, resulting in higher RPU values compared to other DH5α. We used the part BBa_J23101 in the InterLab Measurement context. We assembled a measurement device by inserting the part BBa_I13504 amplified by PCR into the part BBa_J23101. The device was characterized in E. coli NEB10β, JM109, and NEB Express by measuring GFP expression with a cuvette-based spectrofluorometer, a fluorescence plate reader, and a flow cytometer. We also confirmed the promoter activity with a cell-free S30 extract system and measured mRNA by RT-qPCR. For a better understanding on protocols and characterizations, please check out our Wiki page UNITN-Trento iGEM 2015! 8 ul of long term storage glycerol stock were inoculated in 5 ml of LB or M9 + suitable antibiotic in a 15 ml falcon tube and incubated at 37°C, 220 rpm for about 16 hours. These new dilutions were aliquoted in a flat-bottom 96-well microplate, avoiding to perform dynamic experiments in the microplate frame (in order to prevent evaporation effects in the frame). All the wells were filled with a 200 ul volume. Experiment duration time: about 6 hours. 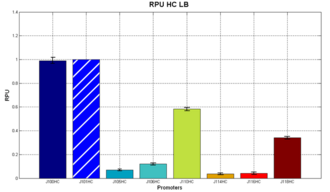 The RPUs are standard units proposed by Kelly J. et al., 2009, in which the relative transcriptional strength of a promoter can be measured using a reference standard. ASB is the blanked absorbance (O.D.600) of the culture, computed as described in "Preliminary remarks" section. steady state must be valid, so (dF/dt)/ASB (proportional to the GFP synthesis rate per cell) must be constant. In order to compute the RPUs, the Scell signals ((dGFP/dt)/ASB)) of the promoter of interest and of the reference J23101 were averaged in the time interval corresponding to the exponential growth phase. The boundaries of exponential phase were identified with a visual inspection of the linear phase of the logarithmic growth curve. NB: unless differently specified, all tests were performed in E. coli MGZ1 in M9 supplemented medium at 37°C in low copy plasmid pSB4C5. Used to quantify promoter strength and the RBS efficiency. 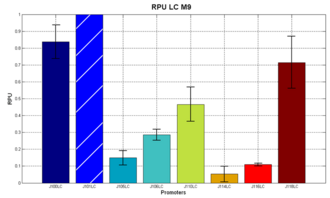 BBa_J23101 is the reference standard promoter for the computation of RPUs. As discussed in 'data analysis' section, RPUs are relative units for the evaluation of promoter strength, based on a mathematical model of the transcription and the translation of a reporter gene. The RPUs are supposed to be indepedent on the experimental setup, provided that the reference standard BBa_J23101 must be assayed in the same experimental condition of the studied promoter. It means that if the studied promoter is in a low copy number plasmid and drives the expression of a reporter protein P, J23101 must be assembled in the same vector upstream of the same reporter P. This approach is in accordance with the philosophy of synthetic biology, based on the concept of 'modularity' of the components. According to this approach, the assembly of basic well characterized modules to build complex circuits allows the prediction of the circuit behavior starting from the knowledge on the basic parts. For this reason, RPUs might not be reliable when comparing the same promoter with different RBSs because of the un-modularity of the RBS. In order to asses what's the effect of RBS 'un-modularity' on RPUs reliability, we have built a set of four constitutive promoters (BBa_J23101) followed by one of the four RBSs tested. These parts were used to evaluate RBS efficiency. Data were collected and analyzed as described in 'Measurements' and 'Data analysis' sections. RPUs and Synthesis rate per cell [AUr] were computed and results are summarized in the table below. NB: in the RPU computation, the J23101-RBS34-mRFP-TT (BBa_J23101) in low copy plasmid pSB4C5 construct has been considered as the reference standard. With this assumption, RPUs are identical to the estimated RBS efficiency. Data are provided as average [Standard error]. On the other hand, if the hypothesis of RBS modularity depending on the promoter is accepted, the J23101-RBSx series we have provided can be used as a library of ready-to-use reference standard for RPU evaluation, that allows to depurate RPU measurement from RBS effect, thus providing only the promoter strength. iGEM2014 XMU-China has sequenced this device. The following data was taken from this device. We choose the promoter J23101 as an in vivo reference standard for promoter activity. In order to get the different expression intensity of BioBrick backbones, we can connect the backbones with the same promoter and GFP generator. Finally we can use the intensity of fluorescent protein as a charaterization data to report the expression intensity of different backbones. Unfortunately, there are few data about it. So we detected the two different backbones as examples and hope the other teams can provide more relevant data. For devices BBa_I20260 and BBa_J23101 + BBa_E0240. Both devices consist of Anderson promoter J23101 and GFP generator BBa_E0240. When the device is constructed in backbone pSB3K3. A low copy number is in expectation, as a result, a weak fluorescence strength is shown. While the device is constructed in pSB1C3 which is a higher copy number vector, hence a stronger fluorescence strength, so that it can be obvious enough to be observed in naked eyes. So we reconstructed this part, and submit the improved part BBa_K1412716 and BBa_K1412924 to the parts registry. BBa_K1412716: BBa_I20260 (J23101-B0032-E0040-B0015), in the pSB3K3 vector. BBa_K1412924: BBa_J23101 + BBa_E0240 (B0032-E0040-B0015), in the pSB1C3 vector. From the plot of optical density versus time, we can conclude that the growth rate of bacteria is become lower with time. We measured the samples three times parallelly, and we can know that the reproducibility of the data is acceptable. 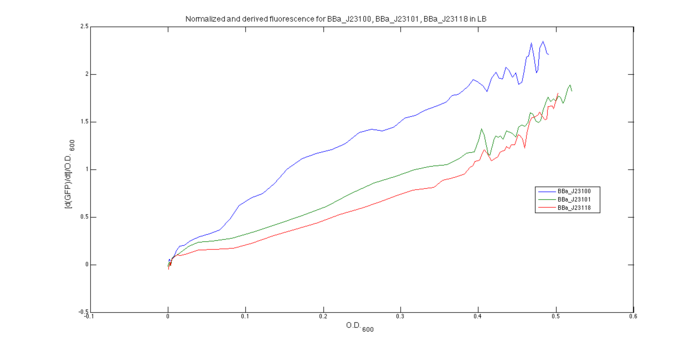 When we compare BBa_K1412716 with BBa_K1412924, we can get that their growth rate are almost equal. From the plot of RFUs versus time, we can conclude that RFUs grows linearly with time. 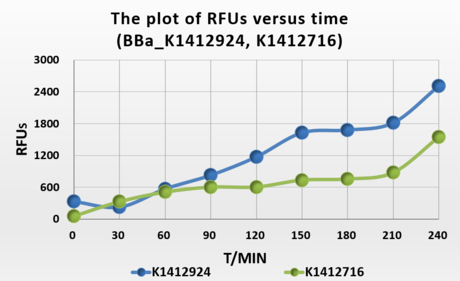 When we compare BBa_K1412716 with BBa_K1412924, we can get that the fluoresent expression intensity of BBa_K1412924 is higher than BBa_K141716, because the pSB1C3 backbone has a higher copy number, hence we can get a stronger fluorescence strength. 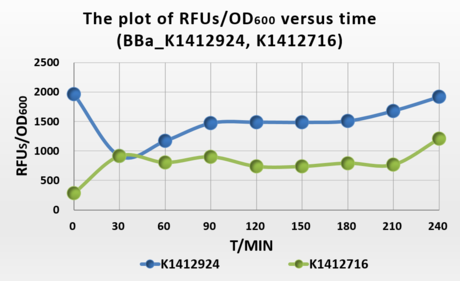 From the plot of RFUs versus OD600, we can conclude that RFUs grow linearly with OD600 both BBa_K1412716 and BBa_K1412924. Because the fluoresent protein expression of each bateria is contain, so when the concentration of bacteria increase, the fluoresent expression increase too. 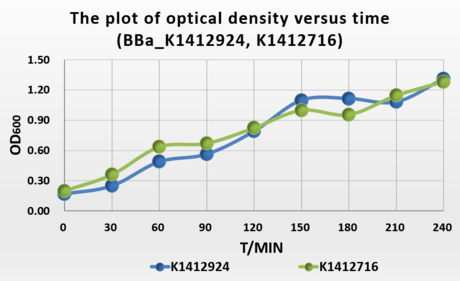 When we compare BBa_K1412716 with BBa_K1412924, we can get that the fluoresent expression intensity of BBa_K1412716 is lower than BBa_K1412924. 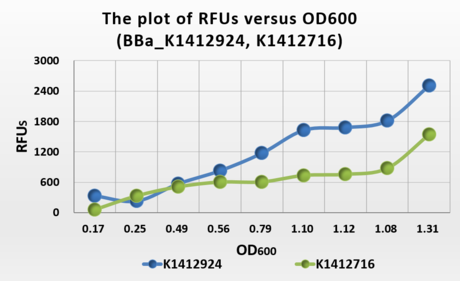 From the plot of RFUs/OD600 versus time, we know the RFUs/OD600 is a representation of the fluoresent expression intensity of unit bacteria. So we can get that the fluoresent expression intensity of BBa_K1412716 is lower than BBa_K1412924. 1. Transformed BBa_K1412924 into DH5α competent cells, coated plates, grown in incubator for 12 hrs at 37℃. 2. Inoculate a 5 ml cultures of supplemented LB medium and antibiotic (Chloromycetin or Kanamycin 50 μg/ml) with single colony from the plate. 3. Cultures were grown in conical flask for 16 hrs at 37℃ with shaking at 200 rpm in the table concentrator. 4. Cultures were diluted 1:100 into three 20 ml fresh LB medium and grown for 3 hrs at 37℃ with shaking at 200 rpm in the table concentrator. 5. Then transfered 650 μl of the culture to a 1.5 ml centrifuge tube, centrifuged and washed twice with phosphate-buffered saline (PBS, pH 7.4) to minimize the background ﬂuorescence from the medium. 6. The washed cells were suspended in PBS and diluted to bring the cells into an appropriate concentration range (2–5 times) before taking ﬂuorimeter measurements. Device: SpectraMax+M5 microplate reader, 96-well plates. Wavelengths: 501 nm excitation, 514 nm emission, Auto-cutoff: 515 nm. 8. Measure every 30 minutes in the next 4 hrs. The constitutive promoters J23101 have been used extensively in our project. In this iGEM project we faced the need to characterize a promoter, the NahR/Psal system (Schell, Mark A. "Homology between nucleotide sequences of promoter regions of nah and sal operons of NAH7 plasmid of Pseudomonas putida. ", 1986) which is induced by salicylate. We decided to compare it with different amounts of salicylate concentrations and also with two constitutive promoters (the J23101 and J23110). Among the existing approaches for measuring the strength of a promoter, we chose to use fluorometry. We did not have access to a fluorometer in our lab, so we decided to build our own.